Charlie has scooted into his spot on the right of me and is snoozing away, tongue lolling out of his mouth. Just another day in the life of Brenda and Charlie Ross. Yesterday I gathered Charlie up and we drove through the nearby Popeye’s Chicken (I’d never been there before) to use a coupon I got in the mail for a meal. I was hungry for mashed potatoes and cole slow. And I’m a sucker for those coupons. It was okay, but not as tasty as KFC. Every time I go to KFC I am reminded of a great aunt who was widowed and didn’t drive. She’s been dead now since the late eighties. Most every weekend I’d go pick her up in my huge old blue Pontiac (the first car I owned which I bought for $400) and I’d drive her there. She loved KFC. 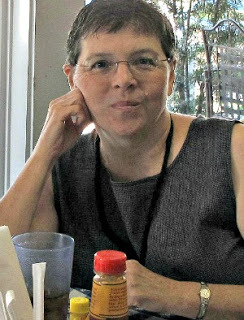 She was very helpful to me when I was single with a small child and trying to both work and go to college classes, where I met my first husband. In fact, I stayed at her house at the end of that pregnancy due to having to go on bed rest, and I let her choose my first daughter’s name. I kind of felt I owed her that. Even with bed rest I ended up having pre-eclampsia and it was a difficult time for me at age 17 to handle all alone. We’ve been outside and Charlie has done his sniffing around and I have taken photos and looked closely at all the plants to see if anything new is happening. It is quiet inside and I hear the soft tick of a clock somewhere. That sound used to drive me crazy, but it doesn’t bother me so much anymore. Yesterday afternoon I watched a silly Lifetime movie. They are overly dramatic but somewhat entertaining. Do you recall years ago when they had nighttime movies of the week on either ABC, CBS or NBC? I forget which network. I always looked forward to those movies. It was my reward at the end of the day after getting kids corralled for a bath and finishing up the dishes. 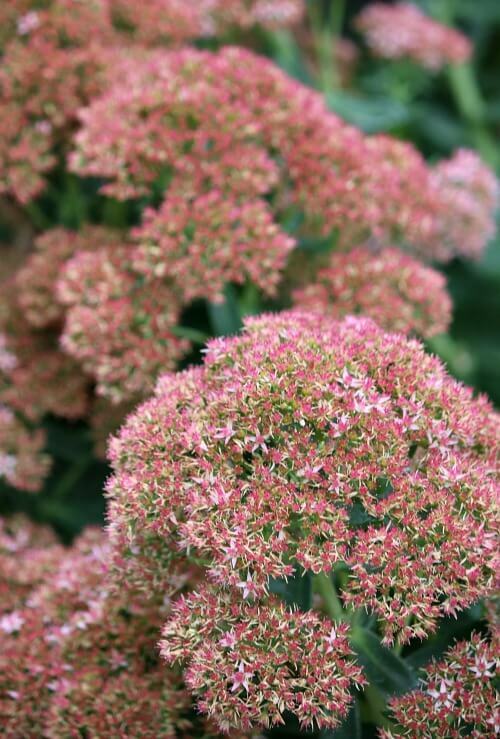 Someone asked what color the sedum autumn joy is now. So here are a few pics. There is such a pronounced evolution of this plant from spring to autumn. When we get our first frost, the long stalks will keel over and I’ll have to cut them down if I haven’t already done so. I haven’t done much maintenance at all on the patio since my second eye surgery. It seems that the air is full of allergens and makes my eyes itch. So I’ve pretty much just left everything alone except for watering the containers. I need to do some dead heading of the spent blooms, which normally is a task I’m right on top of. Earlier I heard the familiar sound of the blue jay. I was only able to get a quick photo before he/she flew away. I have one orange cone flower blooming, and here is another. 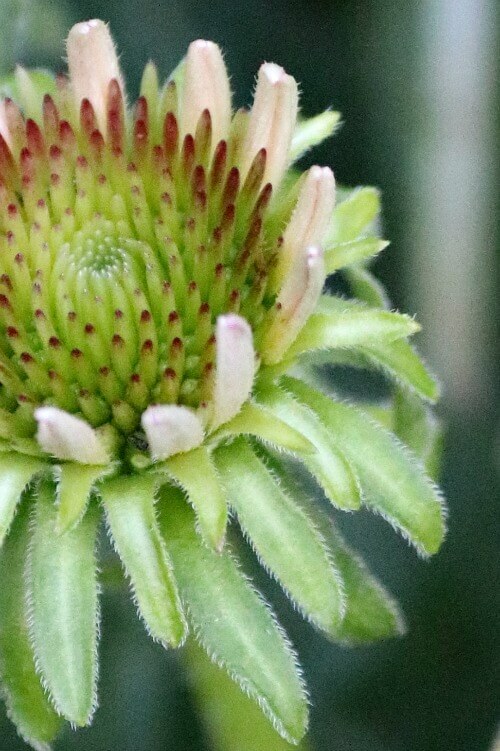 The white cone flower has not made an appearance for a few months. Not sure why that is. They are in the same large container. I’m big on taking photos of a flower from the first signs of it budding. 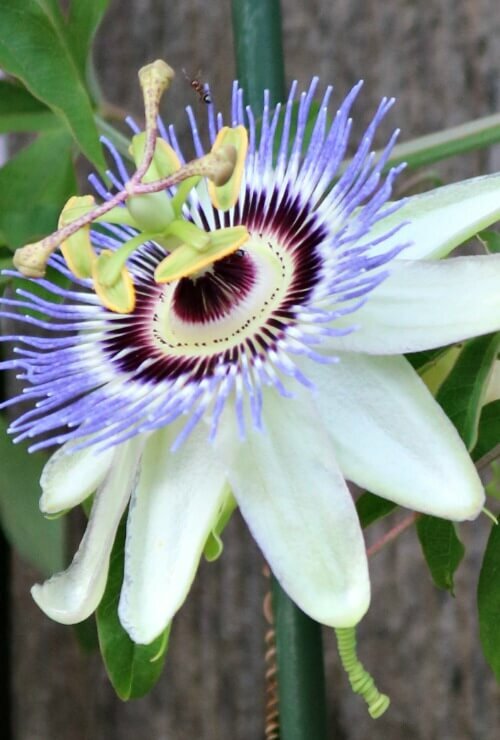 I like to watch the flower evolve. To follow its entire journey. I’m beginning to ratchet down the worry I had with Charlie and all his urinary tract infections that were filled with blood. Almost two weeks have passed since he ended the last antibiotic, and everything so far seems fine. No blood anyway. I think I’ve kind of been holding my breath these last few months worrying about him. Right now he is sleeping peacefully next to me. It won’t be long before he’ll want to go out on the patio and do more sniffing and disappearing into the jungle of plants out there. No sooner did I write that that he jumped up and turned around and stood looking at me, his way of telling me that he wants to go out. I’ll grab my camera and sit in one of the chairs along the wall and let him do his sniffing. Glad Charlie is showing no signs of infection anymore. That probably gives you peace of mind. I have had a taste for KFC for awhile we do not have any near us up where we live anymore. I use to love their Chicken Pot Pies. Have a great Sunday. I had forgotten about their chicken pot pies. I have a KFC just a mile or two away. Charlie gets a hard boiled egg every day at supper time. He likes to eat when I do. I cut up his egg and mash up his vitamin and liver supplement (chewables) and put it all on his plate. He absolutely loves that egg. My mom loved KFC she loved it more than steak ! I like coupons also Brenda but my problem is I forget and leave them behind most of the time .I need to put them in a little packet in my car and then I would have them . Fall is in the air in the mountains of Tennessee and I am ready for it to show it’s lovely face.The nights are getting cooler here on the Cumberland Plateau we live near Sewanee and the University of the south and it is a lovely little village there near the college .People come from all over the world and visit there .And children attend college there from all over the world . It is a tiny little town with lots of beautiful old buildings and scenery . I hope to be able to enjoy it more this fall since I feel better. So happy Charlie is feeling better ,my lil Mallory dog goes for surgery on her tumour tomorrow please remember us tomorrow morning around 9 am ,I am hoping for the best ! Hugs to my two besties ! Have a wonderful Sunday afternoon. I will be thinking of you both! Please let me know how it goes. I have never been to Tennessee, but hear it’s a beautiful state. Now that I think about it, I haven’t had a steak since I left TX seven years ago. I stopped watching the Lifetime channel because it was too much about obsession and murder, every movie. Just got to be too much. I rarely ever watch Lifetime. Just once in a while I turn it on on weekends. Enjoyed your post. What a great writer & talent you are! Glad Charlie is well. Our poochies can be a worry. For me also w sweeties Gidget & Missy. KFC is great! We visit maybe twice a month. Biscuits + slaw is a meal for me. 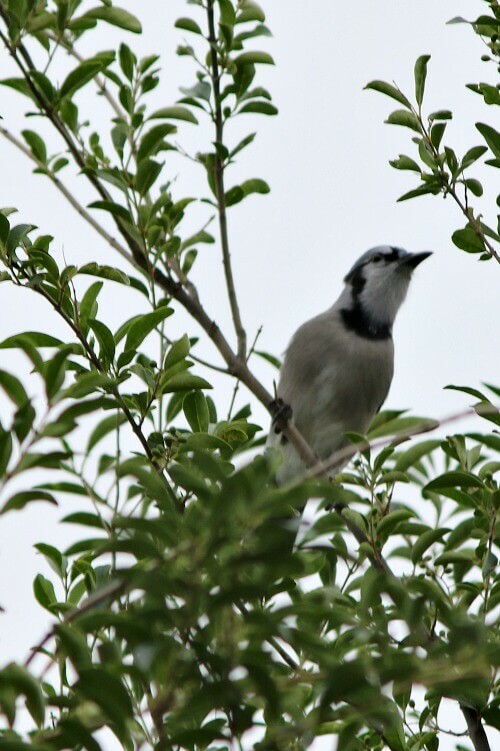 Nice picture of BlueJay! Don’t think I’ve ever seen one in person. Those biscuits are really good! And I love their cole slaw. I am so happy to hear that Charlie is feeling better. I will keep him in my prayers. It is smart of you to leave the plants alone after your surgery, you do not want to irritate your eyes. I have never been to a Popeys. At KFC I used to like the potpie. If you like mashed potatoes they sell potatoes peeled in the freezer section that you simply microwave and then you add the butter and milk to. They are pretty tasty. The bathroom is finished except for the shower doors. IT was a long 2 weeks but worth it. I hope that you have a wonderful day, and a great week. 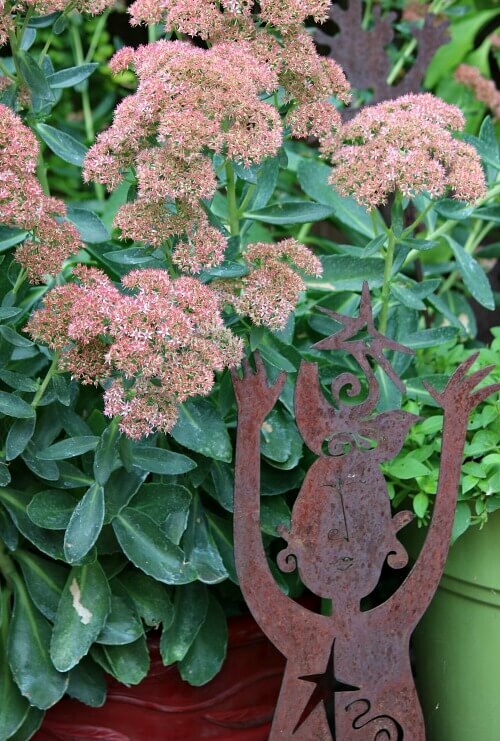 Thank you, Brenda, for the new photo of your pink sedum; it is beautiful! So glad Charlie is well now after finishing the antibiotic. I just had a pot pie at KFC last week for the first time and I thought it was mighty good. I will get one again for sure. I usually have a craving for their mashed potatoes so I surprised myself ordering the pot pie. Brenda it’s so nice you can relax now and know Charlie will be okay. It’s getting cooler here in NY so I see my doggies sleeping in longer in the morning now and being content to lay in their cozy beds near me or snuggled up on the couch next to me. I meant to tell you yesterday in the comments how delighted I was to know you have passed on your love of reading to your daughter. Every time I am in Barnes and nobles and see a young woman buying a book for her child or herself, I just want to run up and hug her. I know I can’t but it’s good to see young folks taking time to read in this day and age of squinting on devices to read. It must make you proud to see her reading. I just love your pictures of little Charlie and all your flowers. So glad he is doing better and has not had any more problems. He is so cute. We had rain last night and it has made everything smell so much better, clean and fresh. We have not had rain since May. Nothing but fires and lots of smoke since June. My little Hayley did not know what to do. When I took her out this morning, she just stood there and sniffed the air and I could not get her to move. Finally she just wanted to go back to the house. I love KFC but ours is 30 miles away, so do not get there very often. Love the mash potatoes and gravy and they do have the best cole slaw. I like the mild version of Popeye’s, I just don’t eat it often. Yesterday I was reading and kept hearing a noise. I muted the television and realized it was Molly snoring! I do so love that little girl. Your plants are still pretty even as fall approaches. Have a lovely Sunday evening. All this talk about KFC and chicken pot-pies has got me hungry for them! I know the location of at least one KFC not too far from my house, but I haven’t been for ages. I try to stay away from fast-food-type restaurants as I like to use primarily organic foods in my diet. Every once in a while, though, I do get something from Wendy’s. Maybe next time KFC! It’s good to have a laid-back Sunday. Time to give yourself permission to do as you please and re-group. I like to spend the day reading the Sunday paper and cooking as little as possible. Eating whatever strikes my fancy whenever I want to. Good for the soul. I’m very glad that Charlie is doing well. Hopefully whatever the infection was is gone forever. It’s been very cold–in the fifties–last night and today. No sun today and rainy. This kind of weather is depressing to me even though I know it is inevitable. Winter is a-comin’, folks! Yikes! You and Charlie have a great week, Brenda! Love hearing about sweet Charlie Boy ! He’s looks so much like a little Teddy Bear ! Love to read your posts before I head off to bed. I find it just completes my evening. Looking forward to your thoughts and musings tomorrow. I’m so glad Charlie is better. you both deserve a break! there must be something in the air here (LOL!!! when is there NOT in Oklahoma?) you would think I have the worst cold. I have been having sneezing fits… like 7 and 10 sneezes at a time. and then a stuffy nose and last night a terrible pain in my right temple. I think it’s just sinus. but it’s miserable. I’ve never had it this bad this time of year! maybe if it rains it will clear the air. I hope so. 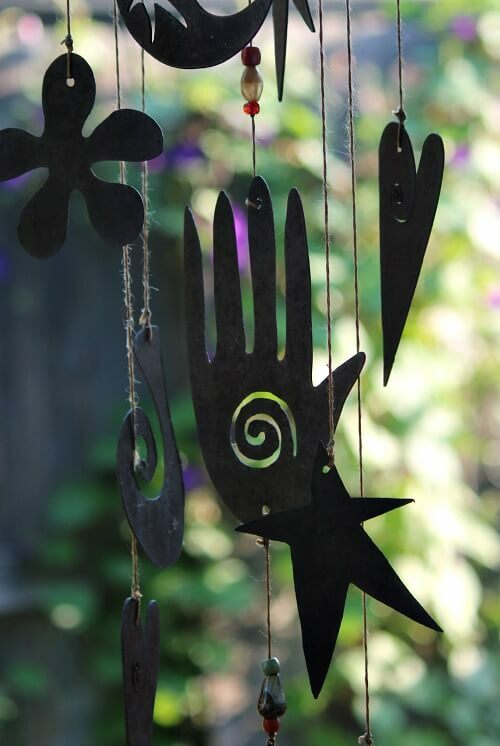 your medal mobiles are very cool! Glad to hear all the nice comments-glad that your pooch is feeling better. My dog went thru a spell of having the urinary tract infections (but no blood sighted). Turned out that my apt. had mold in it. When I became aware of it I moved out. No more urinary tract infections in my dog. Pictures are beautiful. Texas still has warm temps until late December at the earliest. I like to hear that somebody has cool weather. I live here in the land of KFC. For the longest time, I only had Kentucky Fried Chicken at a big family gathering when someone brought a bucket or two of it. But the commercials for KFC have been so funny in the past year or so — look up the one with Reba McIntyre as the Colonel on Youtube to see what I mean — that I’ve gone through the drive-through a few times in the past year. I just get one or two Chicken Littles sandwiches and an unsweetened iced tea with extra ice. It sounds weird, but I got hooked on unsweetened iced years ago when trying to avoid sugary drinks. KFC brews the tea really well, and it has a good full-bodied taste. So sometimes I go there only for an iced tea! My sedum Autumn Joy has gotten fairly dark, and looks great. That’s a delightful close-up shot of your sedum. Your aunt sounds like a wonderful, caring person. I’m glad you had her in your life. You said she named your first child — for some odd reason, both of my parents got to help in naming a younger sibling. My dad got to pick out the first name of his youngest brother, and he picked Harold. Ugh. That brother has always insisted on going by his middle name, Patrick! My mom got to pick out one or both of her younger’s sister’s names and she went for a Hollywood sound — Barbara Lavonne. (The V might be capitalized, I can’t remember.) In both cases, my parents were eight or ten years older than the younger sibling so that’s why they were able to help in the naming. I was less than three years older than my sister so I doubt I was asked my opinion on her name. I had a favorite book at the time about two mice named Pixie and Dixie so maybe I would have picked one of those names!